collection that features cleaning supplies. The style of this Kitchen Towel will blow you away. I love the black and red this designer originally choose but any colors could be picked to suit your needs. These along with some dishcloths would make a great gift set. I think these flowers sitting next to my kitchen sink for those quick cleanups would be mush more cute than your standard dish cloth. These are a must. You might even be able to convince children to clean up their messes with these flowers. Everyone needs a good scrubber. I like the ridges on this one in particular as I think it would be really good at getting at grime on more delicate cookware. I don't typically use sponges because of the germs but what could be better than a washable version. Book people studio has created just that item. A washable crocheted sponge. I have seen Swiffer covers in the past but none with ridges quite like this. I really like the design of this pattern and I feel it would do a really good job at dusting the floors. It will also save lots of money as you will no longer have to pay for refills. These are washable. From Moogly, this Tunisian pebbles dishcloth is uses a really unique stitch that I rarely see but always intrigues me. It also comes with a video tutorial if you are unfamiliar with Tunisian crochet. The easy to use floor mops are great but the refills are really expensive. I was really excited to come across these Wet Jet Mop crochet covers so that I could start saving money on buying those pads. I have to cats and it seems we go through them far to fast. 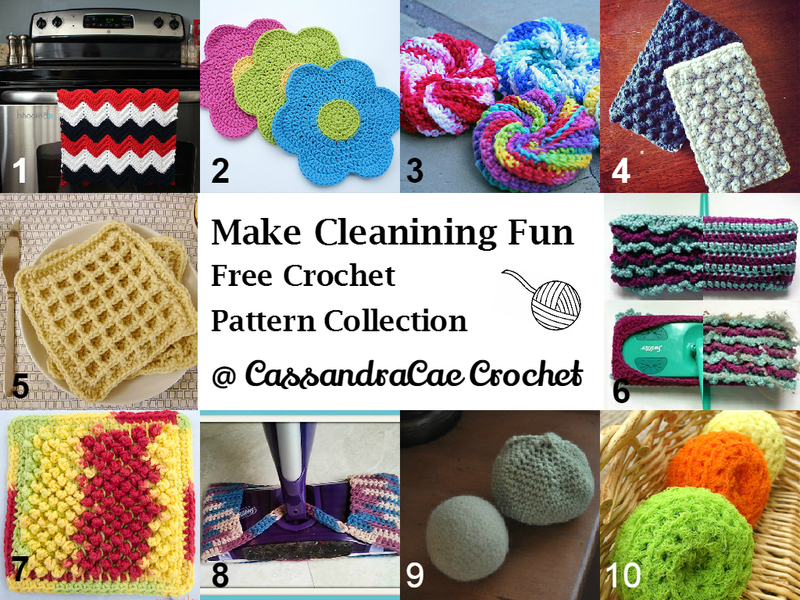 I cannot wait to make these and try them out when I do my laundry. These dryer balls work as a chemical free fabric softener. Depending on how soft you like your clothing, you add more dryer balls. I am going to soak mine in my favorite fabric softener and use it like a dryer sheet. I will let you all know the results of my experiment. One cannot have enough scrubbers. They really have a lot of uses around the home. This pattern was intriguing because of the texture. I really like the texture of the material used to make them and the texture created by the different crochet stitches.